The SBN was a United States three-place mid-wing monoplane scout bomber/torpedo aircraft designed by the Brewster Aeronautical Corporation and built under license by the Naval Aircraft Factory in Philadelphia, Pennsylvania. The landing gear was similar to that on the Brewster F2A fighter aircraft. The SBN had rigid, i.e., not folding, wings with perforated flaps. The United States Navy issued a specification for a scout-bomber in 1934 and the competition was won by Brewster. One prototype designated the XSBA-1 was ordered on October 15, 1934. The prototype first flew on April 15, 1936, and was delivered to the Navy for testing. Some minor problems were found during testing and the aircraft was given a more powerful engine. 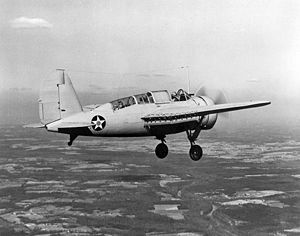 Because of the pressures of producing and developing the Brewster F2A the company was unable to produce the aircraft and the Navy acquired a license to produce the aircraft itself at the Naval Aircraft Factory. In September 1938 the Navy placed an order for 30 production aircraft. Due to pressures of work at the NAF it did not deliver the first aircraft, now designated the SBN, until 1941 and the remaining aircraft were delivered between June 1941 and March 1942. 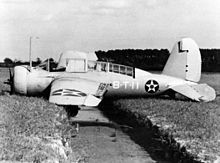 Picture - An SBN-1 in 1941. Obsolete before their delivery in 1941, some of the early production aircraft were used for operation carrier trials with Torpedo Squadron Eight in 1941 and then passed on for use as trainers. With lack of spare parts the aircraft were withdrawn from service from August 1942. XSBA-1 Brewster-built prototype, one built. SBN-1 NAF license-built production aircraft, 30 built.